Since 2010, Vancouver’s Burrard Hotel has been restored to much of its original late-1950’s glory; mixing retro influences with sleek, modern design touches throughout its 72 rooms and central courtyard oasis. Affordable, accessible and fun, The Burrard’s many guest amenities include free internet, HDTVs, in-room Nespresso CitiZ espresso machines, free cruiser bike rentals, complimentary passes to the Steve Nash Fitness Centre and more. 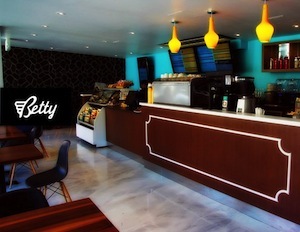 The Burrard is proud to now offer guests and Vancouverites the best amenity of all; “Betty” is a stylish café right next to the lobby – a charming place for breakfast, lunch, drinks, snacks and more. – Authentic Belgian waffles from Kitsilano’s legendary Patisserie Lebeau. – Fresh and flaky pies from The Pie Hole, like Steak & Guinness, Strawberry Rhubarb and more. – Goodies from Beta5 Chocolates & Erin Ireland’s famous “To Die For” Banana Bread. – Pastries, croissants, cookies and muffins from the ladies at Gastown’s Cadeaux Bakery. – ‘Fresh’ by Savoury Chef salads, soups and sandwiches made with fresh, local, seasonal ingredients. – Lesley Stowe’s Raincoast Crisps and artisan cheeses from Little Qualicum Cheeseworks. While there are plenty of non-alcoholic options, from Happy Planet juices to espresso drinks available, Betty is also known to enjoy the occasional tipple as well. Whether it’s the Okanagan’s most popular, award-winning wines from JoieFarm Winery, Red Rooster and Road 13 Vineyards, or local craft beer from much-lauded breweries likeStanley Park, Driftwood Brewing and East Van’s own R & B Brewing, Betty has a little something for everyone! Drop by and say hi! Betty is open from 6:00 AM to Midnight Sunday to Thursday, and until 10:00 PM on Friday / Saturday.